These picnic themed pre-wedding shoots are perfect for all the laid-back couples out there! A pre-wedding shoot is supposed to define your personality. If you are a laid-back couple who likes to chill and spend time together - like have a cute picnic in the middle of nowhere or on your terrace, then the same can work as your pre-wedding shoot setting too! How about setting your small abode with the backdrop of an abandoned fort? Does it get any more romantic than that? Spending time with your bae in the middle of an effing desert? Are you a couple who has spent majority of your courtship time chilling with your bae on the terrace? 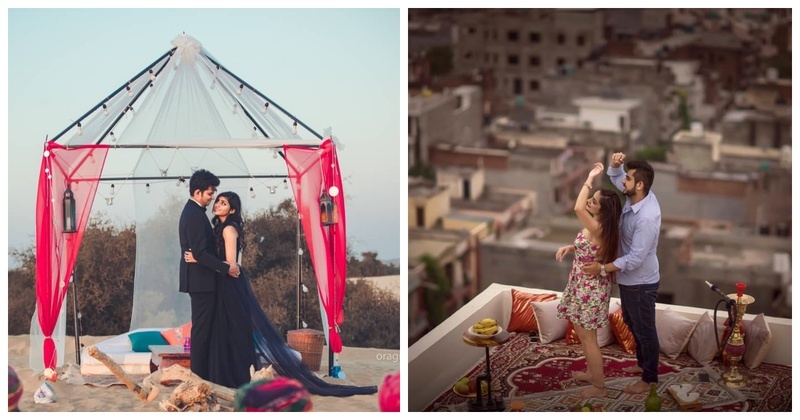 Then do a tasteful setup on a rooftop and get the pre-wedding shoot done there itself! Gives you some major #FairytaleVibes right? All wine lovers rejoice! If you and your bae are truly-madly-deeply in love with wine, then you’ve got to get yourself this vineyard pre-wedding shoot. Picnic in the middle of a park with coordinated outfits? YAY! If long drives have been an important part of your relationship, when you both equally love to take to the roads, you should definitely take cues from this couple. Pro tip: make sure the props you use compliment your outfits, but in a very subtle way. It’ll give an edge too all your photos. So, talk to your bae, get yourself a photographer and just get your picnic themed pre-wedding shoot done already!